This Arcylic case is for Raspberry Pi 3 module B, which with black and red transparent Acrylic layers to protect your Raspberry Pi. You can prevent the CPU safe from overheating with a mini fan quietly spins. Besides, the 0.96 OLED/SSD1306 can provide you with the status of Raspberry Pi running, such as CPU temperature, CPU load, Disk, Internet IP and Memory info. Do not worry about the lack of power, we have the power wall charger for Raspberry Pi 3 B. In addition, this case provides a simple driver tutorial and open source for OLED. Easy assemble (no tools needed). Compatibel with Raspberry Pi 3 model B, Pi 2 model B. Double colling to prevent your Pi being overheating. After install the driver that could get the OLED function work. Step 1: Download and install the driver. Step 2: Start IIC function. Select "Interfacing Options ->P5 I2C -> yes" and exit. Step 3: Boot up settings. Add follow line before "exit 0". 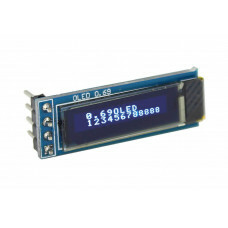 This 0.69inch IIC OLED display is the graphic OLED display module made of 96x16 individual blue OLED..